How do I link a student to an observer in a course? 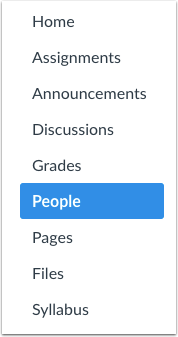 If you have the correct permissions from your administrator, you can link a student to an observer from the People page. When an observer is linked to a student, the observer can observe the student's activities and grades in the course. 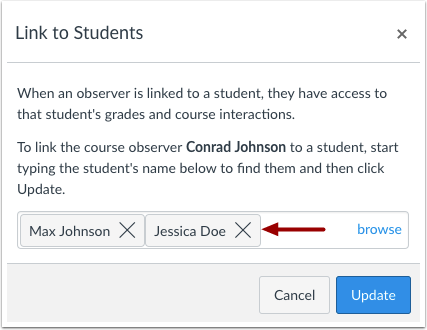 Depending on permissions, you may also be able to link a student to an observer by using a pairing code. 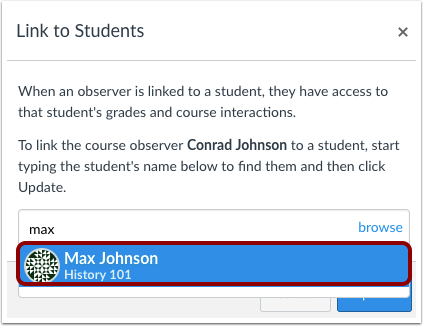 Using a pairing code will link the observer to the student in all of the student's courses. In the search field , search for the name of the observer. You can also filter by observer role in the Roles drop-down menu . Click the observer's Options icon , then select the Link to Students link . In the name field, type the name of the student you want to link to the observer. Select the full name when it appears. You can link additional students to the observer, if necessary. To remove a student, click the remove icon next to the student. View the students linked to the observer. Previous Topic:How do I remove an enrollment from a course? Next Topic:How do I generate a pairing code for an observer as an instructor? Table of Contents > People > How do I link a student to an observer in a course?